The Jerusalem Post Ivrit is a high standard monthly magazine in easy Hebrew for the whole family. The magazine is for people with basic reading abilities in Hebrew, who want to improve their knowledge of the language. The magazine has 36 quality content pages, with an emphasis on Hebrew and Jewish culture. The sections in the magazine vary from personal stories of Hebrew learners from all around the world to interesting places in Israel and explanations of Jewish traditions. Among the different articles there are monthly chapters, abridged and simplified, from well-known Hebrew books as well as dialogues written in normative spoken Israeli-Hebrew about everyday life subjects. The magazine combines the old and the new, the daily and the unusual - it has sections and articles about historical characters alongside texts reporting upcoming cultural events and innovations in Israel, slang words and the lyrics of Hebrew songs from all times. The magazine is colorful and contains many photos and pictures that assist in the comprehension of the lingual materials. The magazine is constructed of articles in three levels - beginners, intermediate and advanced - each article is accompanied by a Hebrew-English-French dictionary and transliteration that help the readers to pronounce the words correctly. The articles for beginners are relatively short or such that they contain basic vocabulary. They are marked with one star on top of their pages. The articles for intermediate and advanced students are marked with two and three stars, respectively, and they are longer or contain a variety of new words or more complex structures of sentences. All the articles are fully or partially punctuated with vowel signs (Niqud). The magazine is aimed at enriching your Hebrew vocabulary and at the same time exposing you to the Hebrew and Jewish culture and to the life in Israel. You can use the magazine to improve your spoken Hebrew, if you use the materials in it as conversation topics in your Hebrew lessons with Ivritalk. "By the way", the literal meaning is "via the back" as if we pull out a comment from somewhere behind our back and place it in the middle of conversation. "Where there's a will there's a way". The Hebrew phrase is the translation of the motto of "Altneuland", Theodor Herzl's utopian novel about the Jewish state in the Land of Israel. "To spare no effort, to jump through hoops". The literal meaning is "to form shapes of the number 8 in the air". Obviously, this expression in modern Hebrew was initially used by pilots. "Last but not least". The literal meaning is "last one, last one, is likable". 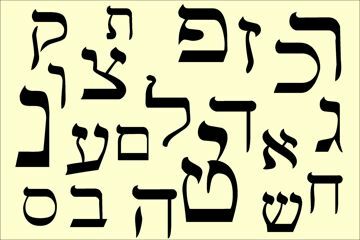 Since Hebrew adjectives have genders and numbers, this phrase can be used in the feminine form and in the plurals forms. "Just because, for no reason". The literal meaning is "why, a hat". The phrase is used in spoken Modern Hebrew as an empty intolerant answer to the question "why?". I can read Hebrew, but only with vowel signs. Will I be able to use The Jerusalem Post Ivrit magazine? The texts in the magazine are for learners of three levels: beginners, intermediates and advanced learners. Therefore, some of the texts contain full vowel signs while others contain partial vowel signs. All the texts in the magazine are accompanied by lists of vocabulary words (and their transliterations and translations to English and French) with full vowel signs. The texts are all composed and edited for learners, so you can gradually read more and more of the text that have partial vowel signs. How can The Jerusalem Post Ivrit magazine help me acquire spoken Hebrew? All the texts in the magazine are written in ‘lite’ Hebrew, and some of them actually focus on spoken Hebrew. For example: every issue contains a dialogue with an everyday life scenario. All dialogues try to imitate the standard spoken Israeli Hebrew that you can hear when Israelis talk. The magazine also contains short texts about Israeli Hebrew slang words. In addition, speaking in Hebrew about the texts in the magazine with The Jerusalem Post Ivritalk Hebrew tutors is a good way to practice your spoken Hebrew. How can I combine reading The Jerusalem Post Ivrit magazine with my Ivritalk sessions? You can use The Jerusalem Post Ivrit magazine in your Ivritalk sessions in several ways. Students who are beginners can read the one star texts and interpret them with the teachers. The teachers can follow their reading and correct their pronunciation. Intermediate students can read the magazine prior to the session, and discuss it with the teachers during the session. Advanced students can apply the vocabulary they learned in the magazine into their conversations with the tutors. They can also contribute their own texts to the magazine. How can the digital version of The Jerusalem Post Ivrit help me evaluate my level in Hebrew? 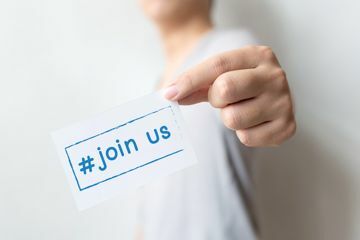 The texts on the digital version of The Jerusalem Post Ivrit are divided into three levels - texts for beginners, texts for intermediate students and texts for advanced students. You can identify the level of each text according to the sing above it - one, two or three starts. The texts for beginners have full vocalization signs (Niqud), their grammatical structure is simple and some of them are relatively short. The texts for advanced students have partial vowel signs and their contents and grammatical structures are more complex. Trying to read texts of different levels will give you an idea of what is your current level. Once you proceed to the next level, you can identify your improvement in Hebrew. Can I use the digital version of The Jerusalem Post Ivrit to teach my children Hebrew? All the texts in the digital version of The Jerusalem Post Ivrit are appropriate for all ages, so your children can enjoy them and enrich their Hebrew. You can pick with your children texts that they might like, such as the serial (chapters from Israeli books that were modified for learners), the dialogue section, the funny sections "Only in Israel" and "That's how you say it in Hebrew" and the Hebrew song section. 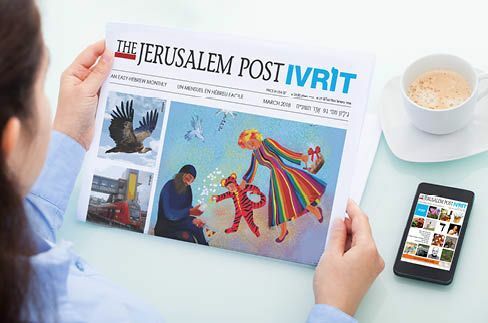 The digital version of The Jerusalem Post Ivrit is filled with beautiful colorful photos and illustrations, and your children can leaf through it and choose the texts that seem to be interesting for them. How can the digital version of The Jerusalem Post Ivrit help me improve my spoken Hebrew? Some of the texts in the digital version of The Jerusalem Post Ivrit are aimed at improving your spoken Hebrew. For example, the every day dialogue is written in a way that imitates standard spoken Hebrew as much as possible. Another way to improve your Hebrew with the help of the digital version of The Jerusalem Post Ivrit is to chat about the texts with the Hebrew tutors of Ivritalk. The level of the conversation will match your level of understanding, and you will get an opportunity to hear the vocabulary as the native speakers of Hebrew pronounce it. You will also be able to demonstrate your understanding of the text, and to receive an immediate feedback.